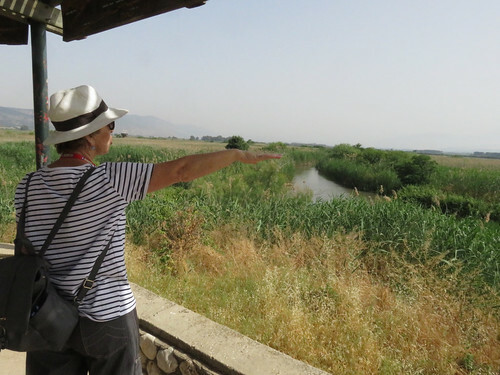 First stop today is the Hula Valley Nature Preserve, a national park providing a twice-a-year stopover spot for mass avian migrations from Europe to Africa and also attracting birders from all over the world. Since its not migration time, we get a “fourth dimension” media experience, including 3D glasses, moving seats, air jets and bubbles describing the restoration of this large wetland from reclamation projects that drained it and channeled all its water for agricultural uses. 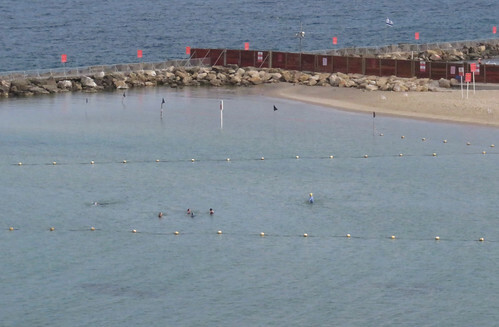 At 6:00 AM I go down to the big public swim area and join wetsuited surfers and guys with beards and moobs jumping in the water. In the locker room on my way out, I see their tzitzit and big hats hanging on hooks. We’re staying at the boutique Melody Hotel across the street from a park that fronts the Mediterranean. After a sumptuous breakfast, our amiable guide, Gabi, ushers the group of 12 Gate 1 travelers under her care to the bus. Six are Russian speakers from New Jersey. Our first stop is to be the Ayalon Institute, an “armaments factory” near the Weizmann Institute of Science and a big high tech park. You are currently browsing the archives for the Excursions category.